Once you get used to smartphone keyboards, you can type pretty quickly — but we’re always looking for ways to enter text faster. Whether it’s typing by voice Free Up Your Hands With Speech-to-Text on Android Free Up Your Hands With Speech-to-Text on Android Why bother with slowly typing on your text messages if you could just dictate them? Read More or using abbreviations, you can cut precious seconds when sending your messages to get back to more important matters. 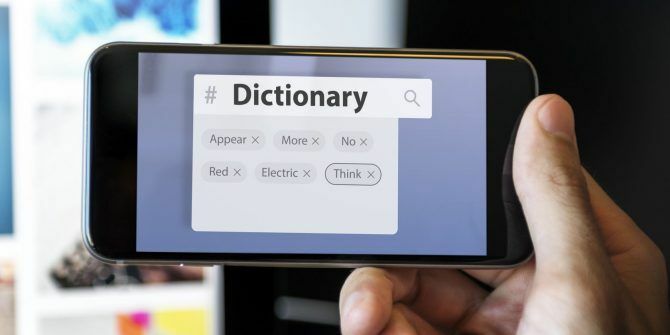 But did you know that your Android phone has a built-in dictionary that you can edit? If you’re tired of your phone auto-correcting last names or made-up words that you use often, you can add them to your dictionary so they’re considered proper. Open the Settings menu on your phone, then navigate to Languages & input. Tap the Personal dictionary entry, then choose the language you’d like to work with if you have more than one enabled. Tap the + icon in the upper-right corner to add a word. Here, you can type out any word to add it to your dictionary. Anything added here is considered a proper word, so your phone will begin auto-correcting mistypes to these words just like any other. What’s awesome is that you can also add shortcuts to words What Is Text Expansion & How Can It Help You Save Time? What Is Text Expansion & How Can It Help You Save Time? If you could save yourself even a small fraction of the time you spend typing, you could save hours of your time every week. That's exactly what text expansion is for. Read More so you don’t have to type them as fast. Type a word (e.g. “MakeUseOf”) and then type a shorter phrase in the Shortcut box. Whenever you type the shortcut, your keyboard will suggest the full word so you can enter it with one tap. This is great for any lengthy phrases you type often. You could make @@ a shortcut for your email address, for example. Note that if you use a different Android keyboard What Is the Best Alternative Keyboard for Android? What Is the Best Alternative Keyboard for Android? We take a look at some of the best keyboards in the Play Store and put them to the test. Read More from the default, this might work differently. In those apps, you may have to long-press on a typed or suggested word to add or remove it from your dictionary. Which words have you added to your dictionary? Have you added shortcuts for common phrases? Tell us how you save time with this tool in the comments! Explore more about: Android Customization, Android Tips, Autocorrect.